BELLEVUE, Wash. — The Bellevue skyline might get a lot taller if three, 600-foot tall skyscrapers get approval. The plan comes from Vancouver B.C.-based real estate development company, Onni Group. The project would be built where the current Barnes and Noble and Doxa Church buildings are located at 106th Avenue North, and Northeast 8th and Northeast 6th streets. The existing buildings and parking spots at the site would have to be destroyed. 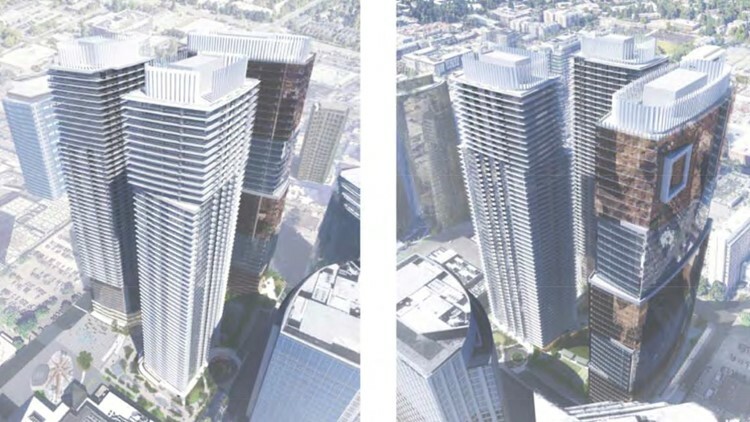 Renderings of proposed towers in downtown Bellevue. The three towers would house 1,289 residencies, 317 hotel suites and 896,000 square feet of commercial office space. There would be six levels of underground parking with 2,300 parking stalls. Another 600-foot tower was proposed this year in Bellevue by Vulcan. It would be built on 108th Avenue Northeast, just a couple blocks over from the Onni Group project. It's described as an office building with retail space and seven levels of underground parking. Bellevue was the fifth-largest city in Washington in 2017 with a population of over 140,000 people, according to city data. The city projects that the population will increase to over 160,000 people in 2035.